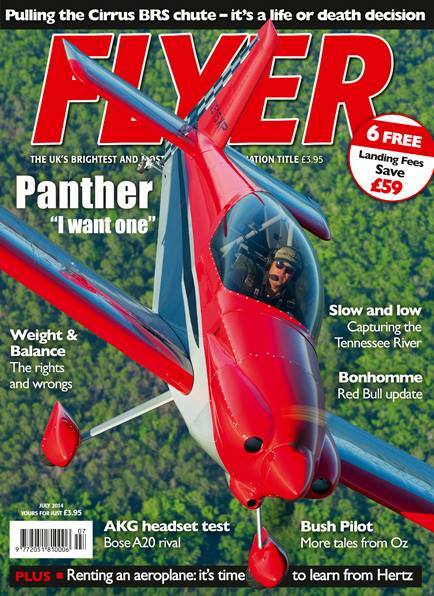 July issue of FLYER for iPad on sale now! Digital and Print Copy available soon. Just imagine flying an aircraft that was so impressive, you just had to order one on the spot. That’s exactly the effect the superb single-seater Panther had on Ian Seager and you can read about his experience in the Summer issue of FLYER. We also take an in-depth look at the Cirrus BRS parachute system, including how it works and asking whether you would pull the chute. Joe Fournier has some sage advice on weight and balance, alongside some examples of when pilots got it wrong. And if you like STUNNING aerial photos, take a look at Ron Lowery’s account of flying the Tennessee River. Elsewhere, we flight test the new AKG AV100 headsets, report back from Europe’s biggest AERO event, hear more tales from the Bush Pilot and learn the latest from Red Bull Air Race world champion Paul Bonhomme. Add in the chance to save £59 in landing fees and much more, and this is another great issue of the UK’s most popular GA title. Click HERE for the Digital Site (get signed up now with your subscription to get notified as soon as the issue is available for viewing). To download on your iPad, iPhone, iPod or Mac got to the AppStore and search FLYER Magazine. One issue is only 5$!